Inner Circles are a Gold Membership feature that allows you to share recordings and/or message board topics with a select group of members. It opens up a whole new world of interaction on the site. You can host private invite only contests, work on a special surprise duet for someone or simply share something privately with other members. Inner Circles have been used in very creative ways to allow for unique and fun interactions on the site. You can create and manage your Inner Circles by clicking on ACCOUNT in the navigation bar at the top of the site, then click on Manage Inner Circles. Creating a new Inner Circle couldn't be easier. 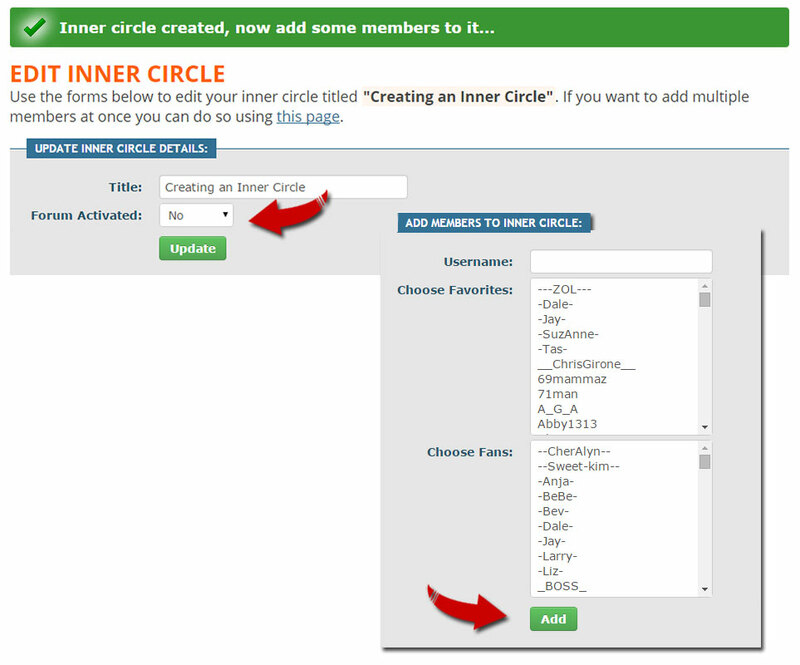 All you have to do is scroll down the page to the Create a New Inner Circle section. Once you enter a name for your Inner Circle and click the Proceed button you'll be able to edit the options for your Inner Circle. You can choose to turn on the optional Forum Activated setting to allow Inner Circle members to share a private message board category. You'll also add and manage your Inner Circle members on this page. To add a member you can choose from your Fans or Favorites list or you can enter a username manually. After selecting or entering a username click the Add button and that member will be placed in your Inner Circle. When you need to manage your Inner Circle you can click on ACCOUNT in the navigation bar at the top of the site, click on Manage Inner Circles, and then click the Edit button for the Inner Circle you wish to manage. You can also delete Inner Circles from this page. Adding a recording to your Inner Circle is very easy. 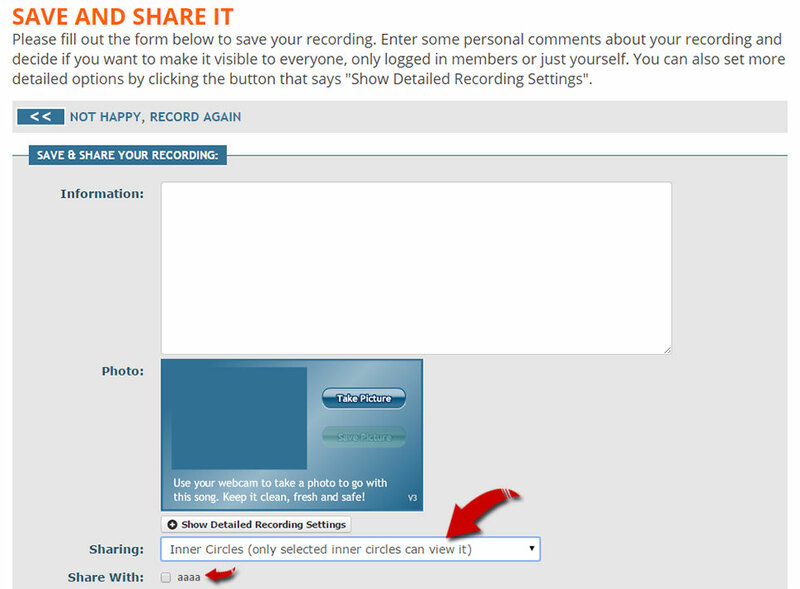 When saving or editing your recording choose the Inner Circle sharing option and then checkmark the Inner Circle(s) you wish to share the recording to. Save the recording settings and you're done! The recording will now be available to anyone in the selected Inner Circle(s). You can view Inner Circle recordings that have been shared with you from the Watch & Listen --> Inner Circles page. To locate your Inner Circle category in the Message Board click on the Message Board tab, then on Inner Circles in the sub menu. You should see your Inner Circle category listed there. Newly added Inner Circle categories will show at the end of the listed categories (bottom of the last page). You may need to log out and back in to see new Inner Circle categories.